Me: "Forget that place. I don't care if it's 1800 square feet; it looks like a shoebox." Bob: "You're right. I think I saw the interior of that house featured in that commercial where the girl just wants to make an omelet. Look at the one down the street though. I think they call that style late-century rambling wreck." After a day of house stalking with only some success, I ask myself, why don't we do this like normal people? I know the score; I watch House Hunters. Step 1: Hire friendly realtor happy to pull a couple of listings for sure-thing buyers. Step 2: See 3 houses, look at the pros and cons, balance it with price. Step 3: Make a decision and an offer on the hood of realtor's car while still parked in front of house #3. Not us. We need to see every house in the town we like. We drive around neighborhoods trying to spot possible pockets of charm. We size up proximity to key landmarks like Peet's Coffee (Starbucks in a pinch) and Whole Foods. The net result is that in Westborough there are exactly 2 neighborhoods that we find acceptable. In Wellesley, there are slightly more. The good news is, we've actually found towns that we like and can afford if we indeed move to Massachusetts. The bad news is that the moving situation is tenuous especially since Bob's situation with his customer took a turn for the worse this week. But I can't help that. All I can do is help drive us to the optimal decision IF the work situation improves AND our house sells for a reasonable price. I'll come back to that in a minute. 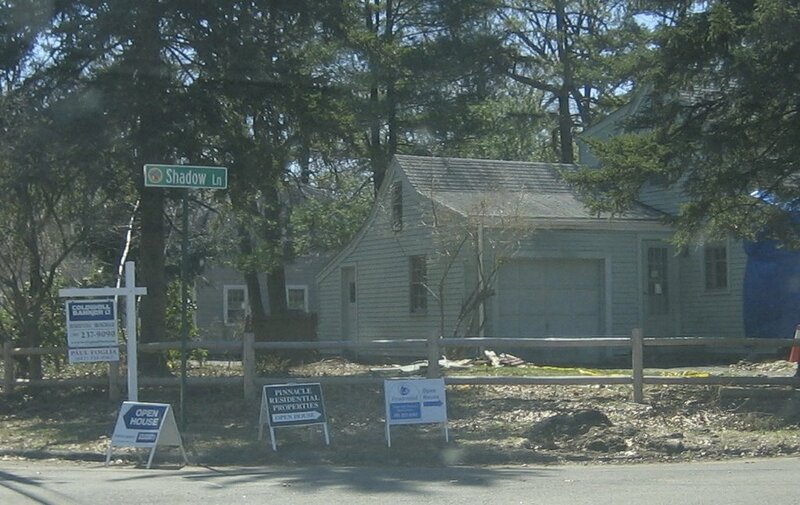 So, as we look at homes in Wellesley, it becomes quickly evident that in order to buy enough square feet to raise a little family, we'd need to sacrifice quality. By quality I mean we'd likely have to live with a dank kitchen, dark paneling and a halloweenie* basement or something equally unappealing until we can find the means to renovate. The part about picking new cabinets and flooring gets me giggling like a little girl but then I check my head and realize that demolition and renovation would not be fun to live through especially with a toddler who has a proclivity for chewing on construction materials. Anyone have any experience and advice on how to find a contractor who won't rip us off? Speaking of checking one's head, do you all find the first sentence of this listing to be as profane as I do? Marketing lesson 101: Know your buyer. I felt for a short time like throttling the horrible realtor who thought this description would appeal to potential buyers. Call me crazy but it infuriates me that she's demeaning 10 years of work, equity we've earned on our actual first home and the savings we've managed to accumulate by suggesting that this is what we should have been able to purchase fresh out of school. Is she so out of touch she thinks a young couple makes a combined salary of $250k which is approximately what they'd need to qualify for this uber-mortgage? Or is she such a poor saleswoman that she thinks, starter home = starter family without considering the financial reality of that assumption? Or perhaps she thinks it's normal for one to buy property later in life say, mid-career. After all, according to our friend David who is currently living there, most Parisians will never own their own home. Perhaps Bostonians will be forced into the same predicament. Whatever the case, I believe she must be part of the cartel leading people to believe that taking out interest-only mortgages is a sound way to get into a home. I couldn't help but smile a little when I read this article promising that she must be living in a cardboard box afforded by her real estate salary of $50k which will be so diminished shortly that she and her cohorts will be on their way to the unemployment line. On the selling side, I'm equally as rapt. Our realtor Max, will surely tell you that we're his most high-strung clients to date. Our place has been on the market for 3 weeks now and in that time, I've devised a website, created a marketing plan and researched all the advertising venues available. Now I'm trying to resign myself to the reality that, short of standing out in front of our gated neighborhood waving a sign as is the custom in Phoenix, all I can do is sit by the phone waiting for Max to call with offers. *Bob's taken to using this word as an adjective to describe any dark, enclosed, spider-infested section of a home. Usually it's the basement but believe us, some people don't see these areas as a selling drawback. But then maybe they haven't been watching Lisa Laporta's genius. Does this home come with an underground tunnel to the delightful neighbor's home? And, if so, would we be invited for drop in dinners when I don’t feel like cooking?